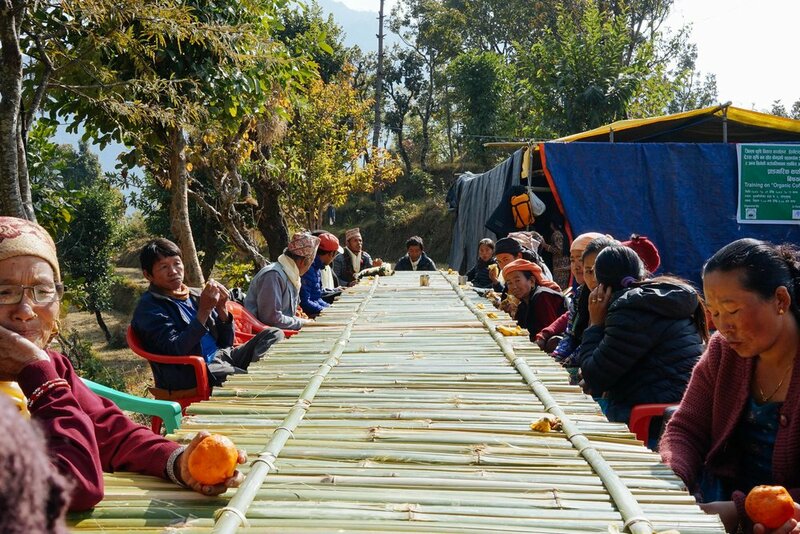 Back in January, our volunteer Meleah, visited Deusa in Solukhumbu to attend a coffee growing and co-operative training event run by our partners EcoHimal and Helvetas. Meleah is working with us to create a new film telling the story of the coffee growing revolution that is happening in Deusa and Waku. Below are some of her photo's from the co-operative workshop she attended in Solukhumbu in January. We have just heard the fantastic news that a new co-operative has now officiallly formed in Deusa! A temporary field classroom was constructed to host the two day workshop, which attracted over 50 farmers from across Deusa and Waku. Narayan Dhakal from Eco Himal Nepal opens the session. 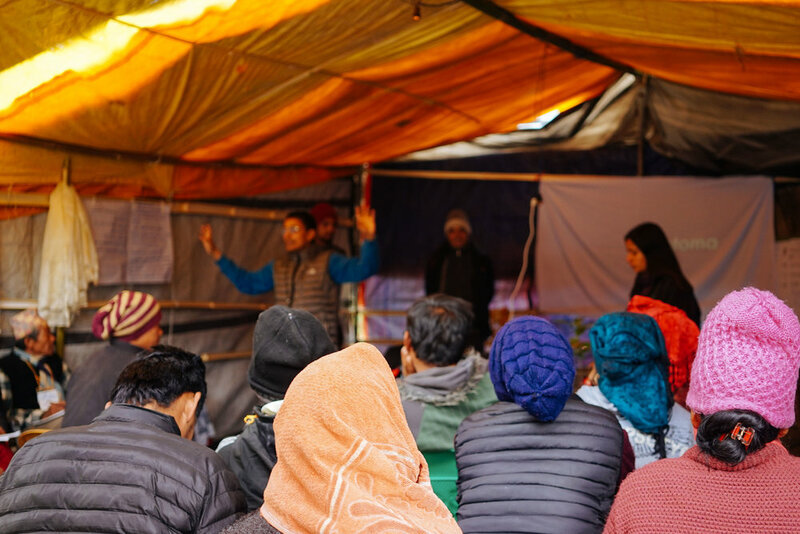 Narayan has given training on organising and running co-operatives across Nepal and in several other countries in the Himalaya and Hindu Kush region. A farmer asks a question during the workshop session. Workshops in Nepal are not all lectures and note taking. Togetherness is a key value in successful co-operatives. Narayan Dhakal leads an exercise outside to break up the day. Participants were provided with stationary to take notes and handbooks to annotate for future reference. Participants take a break and share some refreshing local oranges. Meleah and Narayan both reported how encouraging it was to see the amount of information the participants were recording, a tangible sign of how engaged they were in the workshop and the co-operative concept. Fresh ground coffee, locally grown and delicious. A vital crop for Deusa and Waku as it adapts to climate change. We are very happy to report that as a direct result of the training, a Co-operative has now been formed in Deusa! The Deusa Co-operative that will meet at the Deusa AFRC has 13 members, male and female, from across the community. By coming together in this way, farmers are better able to budget, plan, farm and sell coffee, oranges, banana's and other crops. 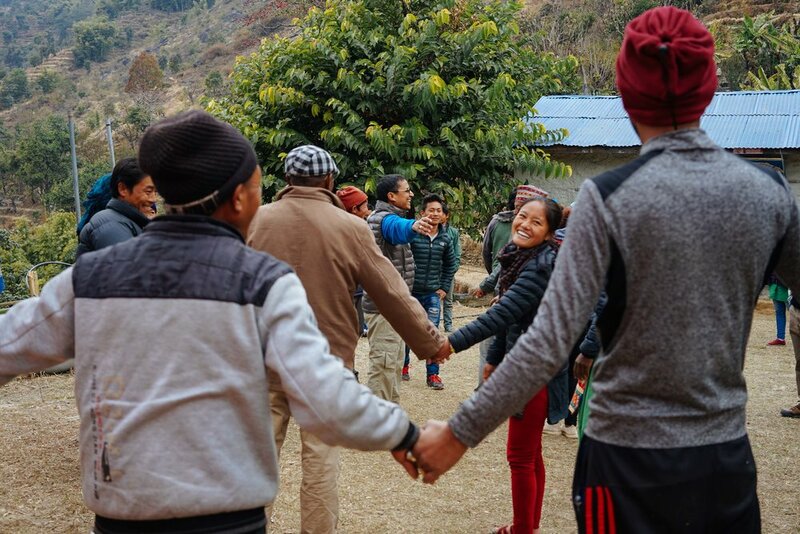 Hari Kumar Kharki, the Eco Himal project officer who is leading on the projects TGT fund in Solukhumbu sent us this photo of the newly formed co-operative who met at the Deusa AFRC on Friday. He assures us that despite the tired looking faces, they are delighted to come together in this way! Deusa farmers Co-Operative, formed April 2018 at Deusa Agro Forestry Resource Centre (AFRC), Solukhumbu, Nepal. Co-op members are pictured here with family members and staff from Eco Himal and the Deusa AFRC.